middle school, and high school. Our after-school program operates Monday through Friday from 3-6pm. Our tutors are a combination of adult volunteers, local college students who earn work study hours by offering their services, and local high school students interested in helping their peers. Members of the Board at the ROCK supervise and train these tutors, in order to maintain excellent service to students from our local community. The ROCK Community Center is located at 1597 Yosemite Drive, down the street from both Eagle Rock High School, where we have operated since 2001. In addition to our Tutoring Room, students are invited to use our Rec Room (also free of charge), complete with free wireless internet access, online computers, board games, and video games. Once again, supervision is provided by local volunteers, who are in turn trained and supervised by our Board. PARENTS & TEACHERS, please feel free to send your students our way! 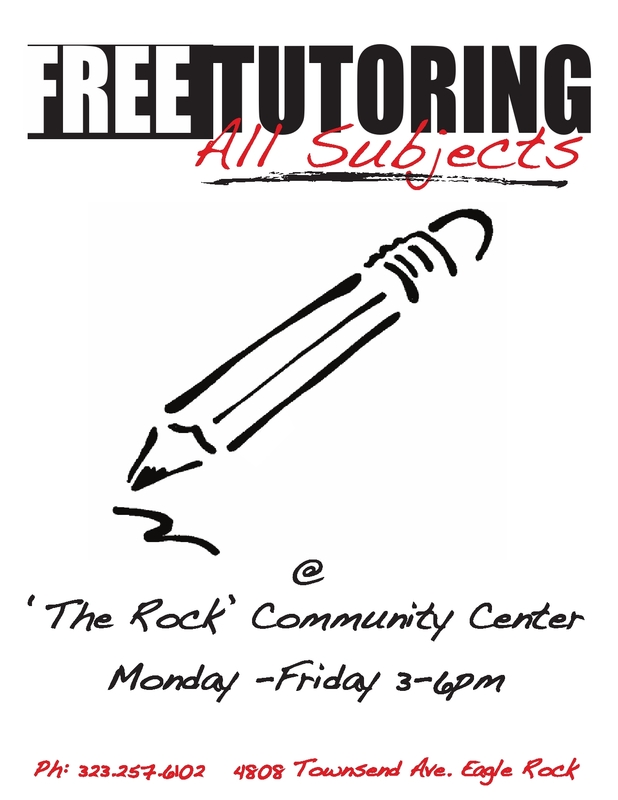 Contact Art Galvan if you have any questions: art@therockcommunity.org.